After the 2007 draft, Stephen A.’s status at ESPN starts to change, and that has its own implications for the hecklers. Martin Bell: In between the 2007 and 2008 drafts, a lot starts happening to Stephen A. Smith. He starts becoming like a real lightning rod for criticism, and it seems as though he’s starting to wear his welcome out with ESPN. At that time his show, which of course was called “Quite Frankly,” had aired, been kind of an embarrassment and gotten cancelled. So there was an announcement shortly before the 2008 draft, which I think I picked up on my SAS Google Alert, that he was no longer going to be on the main stage. His actual draft performance had gotten a lot of criticism too. [In 2006], he talked a lot of smack about like LaMarcus Aldridge and the Blazers’ draft, and Aldridge turned out to be a superstar. You know, it’s a take factory, and a lot of his were really bad. So they had demoted him for 2008, which was a real, real, boon to what we were doing. Because otherwise if there’s no angle in a given year, it starts to get a little old. But here, it was sort of like we were chronicling the fall of SAS. So if you watch the 2008 video, it’s considerably darker. It’s about this sort of man who has had this stratospheric rise, Icarus-like, and now sits at the bottom of that mountain recognizing that the cartoon character he created, that persona can only carry him so far. Bell said that made finding new ways to mock Smith easier, and that was one of the highlights of the 2008 video for him. Martin Bell: I brought the sock puppet back for a little intro at the beginning, and the signature part of the 2008 video, at least for me…there are really two moments that I remember vividly. One is SAS sitting there in the middle of the second round, in between interviewing middling prospects at that point… off to the side of where the main panel is, I think he’s been replaced by Jeff Van Gundy, and he looks miserable. Oh my god, SAS looked soooooo miserable. He just looked like, you know… he just looked incredibly sad. 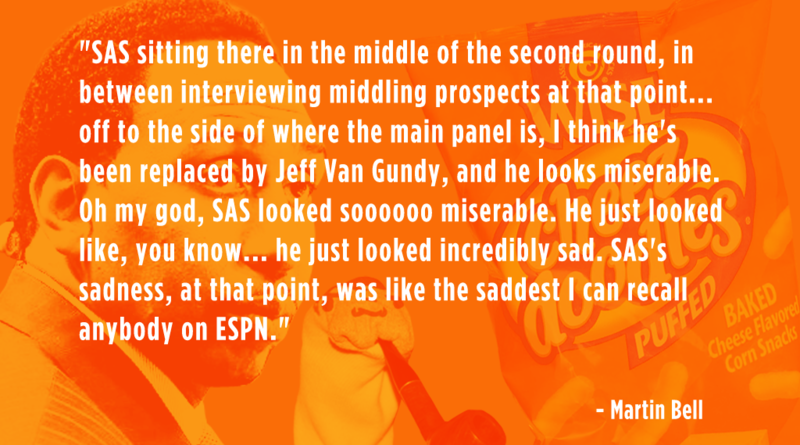 SAS’s sadness, at that point, was like the saddest I can recall anybody on ESPN… excluding like Stuart Scott’s death. It was just amazing, and we were able to catch some sort of candid moments of SAS just sort of meditating on his demotion, and we had some fun with those. There were still plenty of player interactions, though, including a memorable one with Kevin Love. Martin Bell: I hadn’t anticipated anything like that ever happening. In retrospect, I guess it’s not super-surprising, but it was such a giddy thrill. You hear the SAS approach, but when he says “Cheez Doodles” and I exclaim “YEAAAAHHHHHH!” afterwards, that’s just authentic joy. Martin Bell: We actually confronted SAS face-to-face after the draft. At the very end of the 2008 video…we exited on the 8th Avenue side of the Garden and as it happened, SAS was walking out that same way. I couldn’t believe it; the implausibility of the timing was astonishing! So I whipped out my video camera… I didn’t even know where the sock was, I could have been wearing it. And I didn’t know what to say, I was just sort of speechless. And also, I worried about, like, getting arrested. So I followed SAS and was like “QUITE FRANKLY, STEPHEN A. SMITH, YOU DID A GOOD JOB TONIGHT! CHEEZ DOODLES!” and he kind of walks away and extends a peace sign, so I’m like “yeah, that’s enough.” So that was sort of peak SAS. Will Leitch: I was happy to see him go. You’re not happy to see anyone lose their job, but I was happy to not have to look at him on TV for a while. Martin Bell: It was an odd feeling because every now and then, people I knew would say “Wow, you got rid of SAS!” and of course we didn’t. We may have contributed to a sort of public sensibility that was counter to SAS that had gotten a little bit more of a voice. Honestly, when SAS lost his job at ESPN, he stopped being this sort of cartoon character that he’d been. He started sort of being a human being, and in the abstract I think the first thing I’m thinking is “Geez, I hope the guy lands on his feet and is OK.” I will say that, among my friends, that was not a unanimous reaction. I think there were people with a more boundless and bottomless vitriol towards SAS. But I didn’t take a particular joy in SAS being fired. I didn’t want the guy to be out of work, I just wanted there to be less of him. Brian Hughes: It was a mixed bag. I really can’t stand listening to him because he’s so ridiculous. In a way, I was like “Thank God, I don’t have to deal with this moron on a consistent basis.” I used to watch a ton of ESPN. I was also not unaware of the fact that Marty and the two of us, myself and Pat, had carved out this nice little niche of mocking him, as he’s writing for like the Philadelphia Inquirer and not doing much else. Couldn’t be much less interesting. There were going to be far fewer YouTube videos for a sock puppet writing mock articles for the Inquirer. Smith’s absence changed the approach for the 2009 video, though. However, without Smith, there wasn’t as much material for the hecklers, and it became clear it was time to wrap it up. Martin Bell: The problem, of course, is that since SAS isn’t actually at the draft, there is nobody to heckle. So it’s all going to be sock puppet action, and it suffered. By the time I came back from the draft, I didn’t have the same sort of feeling that I had after the last few. A number of things were different. SAS was no longer there, and so if SAS is no longer there, what does the SAS Heckling Society even mean? Also, my friends and I all had jobs at that point, so it was hard for us to really spend much time waiting in line for tickets, let alone doing this exercise together. I also think that even if we were sort of able to duplicate the same circumstances after a while, it had gotten a little old. It had a sort of arc where we started out with a rugged beginning in the first video, and then we had the first real polished thing where we introduced the SAS puppet. And then we had the third chapter which was SAS’s dramatic fall. Look, there is a reason why trilogies are a lot more common in movies than quadrilogies or whatever we call them. That would have been, I think, a structurally satisfying place to end. Once you do the fourth one afterwards, you’re sort of pushing it and it becomes a more joyless exercise. …In 2009, I basically did what I knew was the last one, and probably one too many. The heckling of Stephen A. Smith and his rise, fall, and rise again – Prologue: Cheez Doodles?!?! The heckling of SAS and his rise, fall, and rise again – Part I: Why not heckle Tom Tolbert?